Among a sea of white faces belonging to former commanders in chief, Barack Obama marked a decisive change in what an American president looked like 10 years ago when he won his first term. And with the unveiling of his official presidential portrait Monday, the nation’s first black president is continuing to affect the visual presidency. 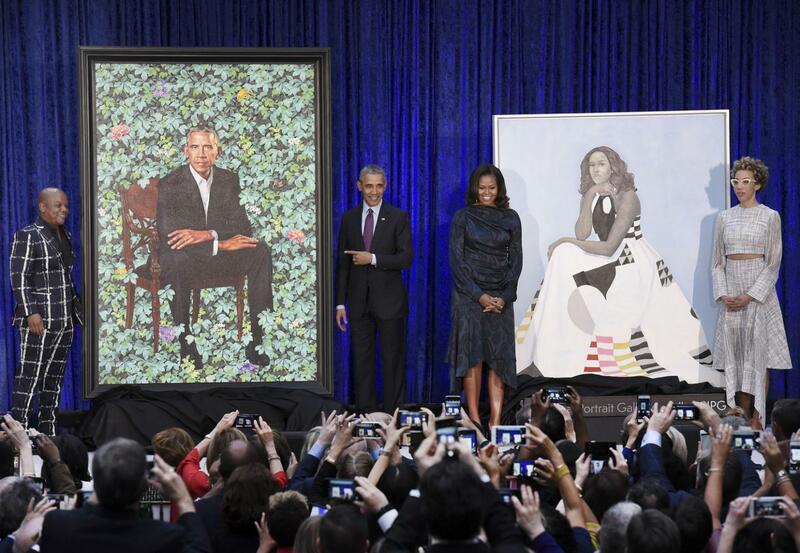 The painting, introduced alongside former First Lady Michelle Obama’s, premiered at the Smithsonian Museum’s National Portrait Gallery in Washington, D.C., among official portraits spanning back to George Washington. The striking composition featured the former president seated, leaning forward, arms crossed, in a chair with a layer of flowers and leaves directly behind him. With other presidents in recent history portrayed in comparatively boring postures — George W. Bush holds the back of a chair in the Oval Office and Bill Clinton stands staidly in front of a fireplace — the new Obama portraits caused a stir among some of the former president’s supporters and detractors. As with much commentary from the Obama era, the discussion was rife with absurd and extreme reactions. “Obama’s Portrait Artist Has Habit Of Painting Black People BEHEADING White People,” read a breathless headline on conservative activist Ben Shapiro’s online website, the Daily Wire. On Twitter, Fox News talking head Sean Hannity tweeted out an article alleging “inappropriate sexual innuendo” and “SECRET SPERM” in the portrait. Cooler heads focused on the painting’s aesthetic and political aspects, discussing its role as a historical artifact and objective representation of its subject. But it’s important to remember that every presidential portrait functions to some extent as a work of propaganda. And this particular piece of propaganda performs its part as a powerful symbol of the spirit of Obama’s time in office almost perfectly. The recently unveiled Obama portrait is undeniably more enthusiastic about its subject matter than most of its predecessors. Colorful flowers, individually representing places of personal significance to the former president like Chicago, Hawaii and Kenya give the image an air of optimism and festivity. Obama’s posture suggests confidence and preparedness. The effect is similar to a more colorful version of the 2008 depiction of the then-Illinois senator in artist Shepard Fairey’s classic “Hope” poster. Of course, every depiction of a political figure as important and universally recognized as the president of the United States will be political. But in the aftermath of a presidency rife with baseless conspiracies propagated about the president’s identity — dealing with everything from his birthplace to his religion — it seems apt for Obama’s official presidential portrait to dispense with the useless pretense of objectivity. It’s been a little more than a year since Obama formally stepped down from his post as commander in chief, and feelings about him are obviously still heightened. If, like many, you’re feeling nostalgic for his time in office, it’s not a bad idea to take solace in this memento.